Every year around this time, NBA fans get excited about the playoffs. Some fans want to see the reign of Lebron James and the Heat, others would love to watch them fall; Some root for the underdogs; Others just love the excitement of NBA Playoff basketball. But basketball isn’t the only thing exciting about the playoffs, the designer clothing the players wear to the arenas excites a certain, fashion-foward, type of fan. Below are some of the latest fashions from your favorite NBA players from round 1, game 1 and 2 of the 2014 NBA Playoffs! The best dressed award goes to the LA Clippers center, DeAndre Jordan. Seen here wearing a Dries Van Noten printed shirt and a custom suit from Paige Geran, DeAndre wins our Athletchic Athelete Style award. Runner-up goes to Chandler Parsons of the Houston Rockets. Rocking these flashy Louis Vuitton shoes and a printed Dolce & Gabanna cotton shirt before round 1, game 1; Parson comes in strong at number 2. Finally, in 3rd place, LA Clippers star, Blake Griffin dazzles us with his fashion forward style. He gets an A+ in our books for both the black-gray suited look from game 1 and the casual game 2 look. Marcin Gortat (right) of the Washington Wizards celebrated his game 2 victory in this gray suit with teammate Nene (left). 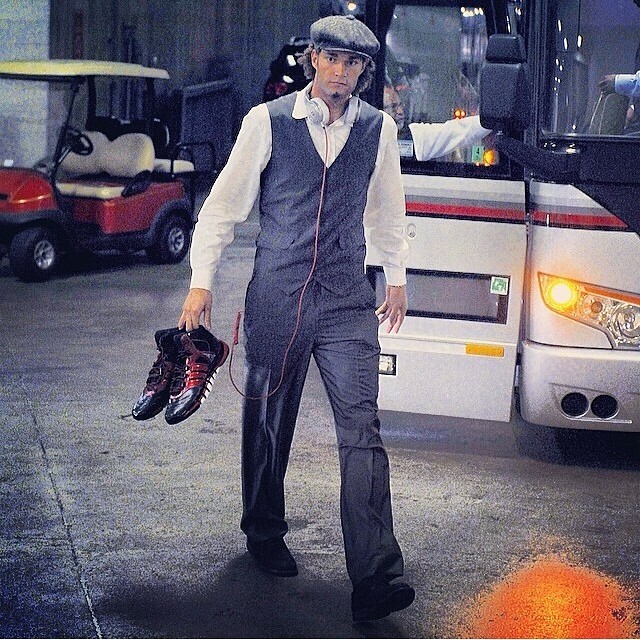 If you follow Gortat on Instagram you will love his European style. 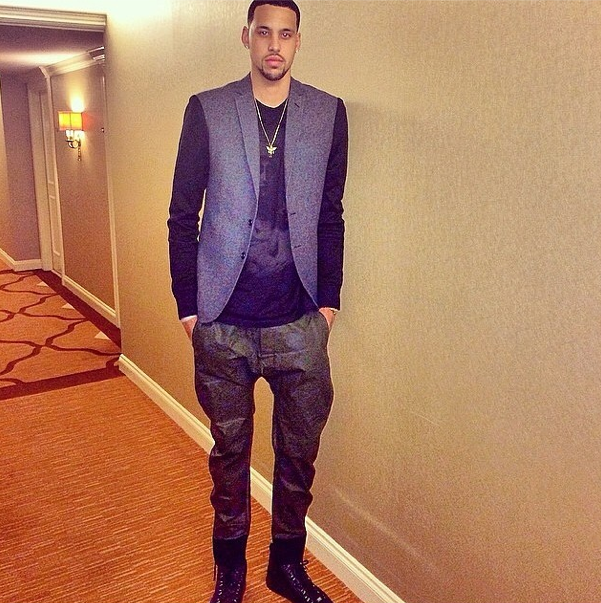 Matt Barnes, styled by Brandon Williams, is on point prior to round 1, games 1 and 2. 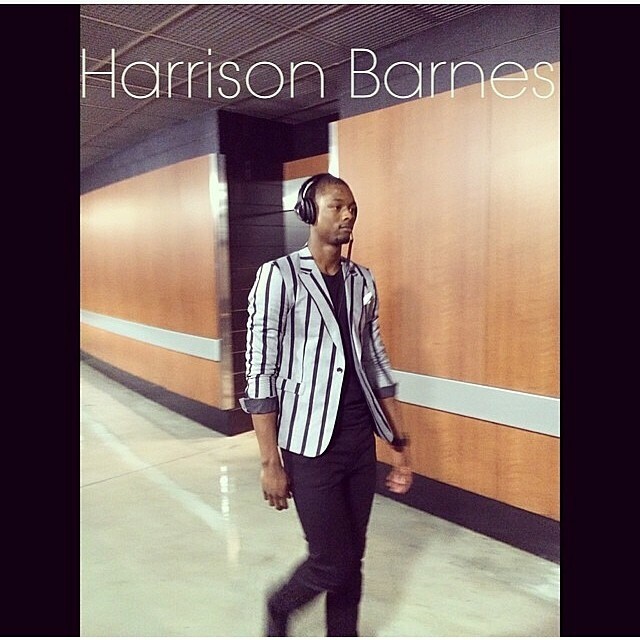 For game 1, Barnes sported red G-star denim pants and vintage YSL sneakers. Brandon Williams does it again in game 2, when he styles Matt Barnes in this fitted blazer. 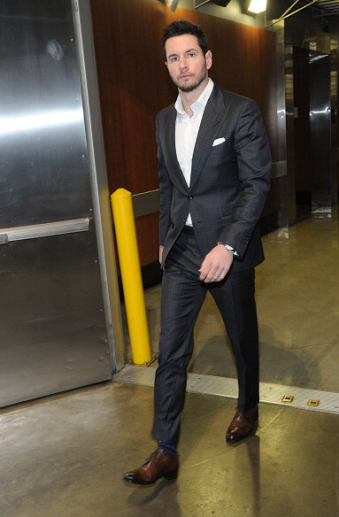 Miami Heat’s All-Star, Chris Bosh looks dapper in this Waraire Boswell suit, Alexander Wang Top and Louis Vuitton shoes before dropping 13 on the Bobcats in game 1. To start out the list, poor Kevin Durant. 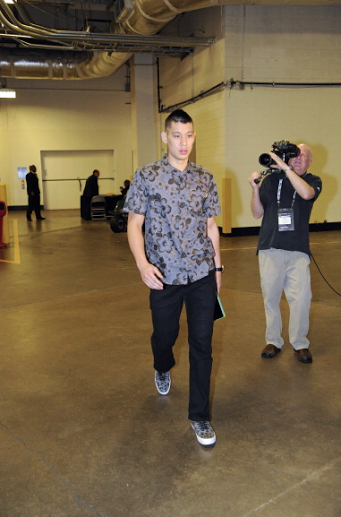 The OKC Thunder forward looks like a middle school boy before game 2 with his short-sleeve button up dress shirt which is untucked over tight fitting camo pants. This outfit could be the sole reason for your game 2 defeat! 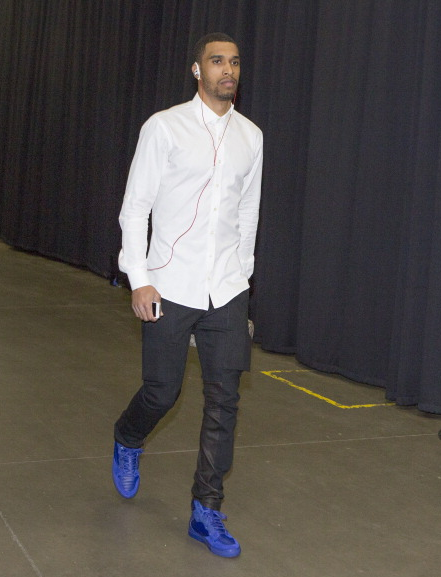 Terrence Jones of the Houston Rockets strutted into game 1 wearing this high-fashion number. The only problem here is that it’s a huge fashion FLOP! High fashion or not, Terrence looks like he borrowed my grandmothers sweater. Terrence, if you ever want to win another game, the basketball Gods need you to change your shirt! 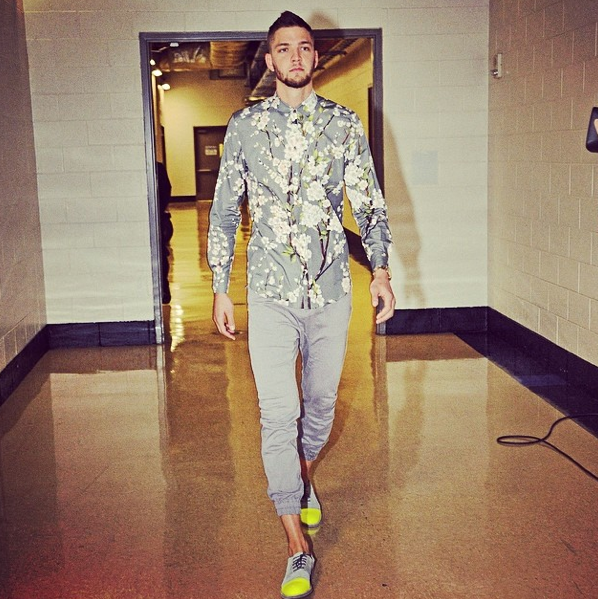 Another Oklahoma City Thunder player rounds out the list of the Fashion Flops. OKC’s young talent is normally known for their flashy, fashion statements which turn into trends, but this week OKC is a Fashion Flop repeat offender. What was Russell Westbrook thinking when he stepped out of the house in these two outfits? Westbrook set the color blocking tone all wrong in game 1 when he walked out of the house in this red number. Men can actually pull off skinny jeans, but Russell, WHAT IS GOING ON HERE! The red pants look like low-rise, hip hugging jeans that are a little too tight. The unmatched baggy red shirt overtop doesn’t help matters. One of Westbrooks Instagram followers said he looked like Elmo, and I think he is right! For game 2 Russell’s clothing situation doesn’t get any better. Again, we find Westbrook wearing overly tight skinny jeans. Such a shame! Aside from the best and worst lists, here are some other NBA Playoff Fashions. 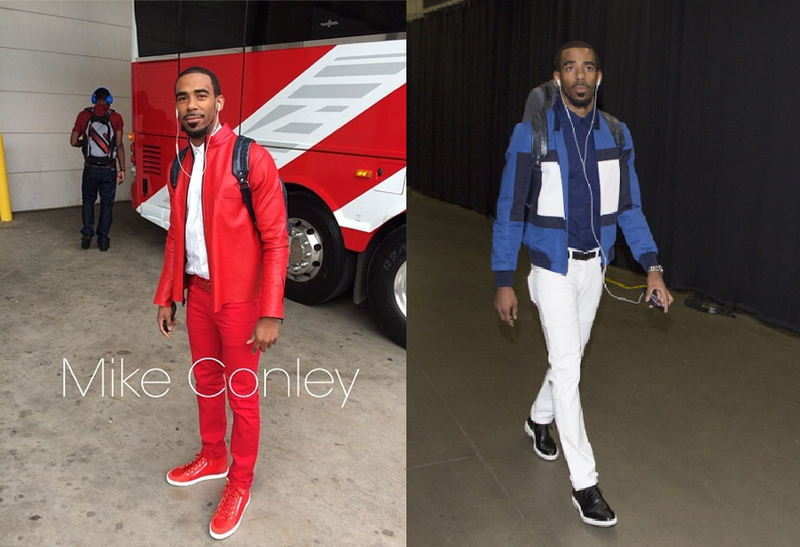 Mike Conley (Memphis Grizzlies) – Styled by Brandon Williams. 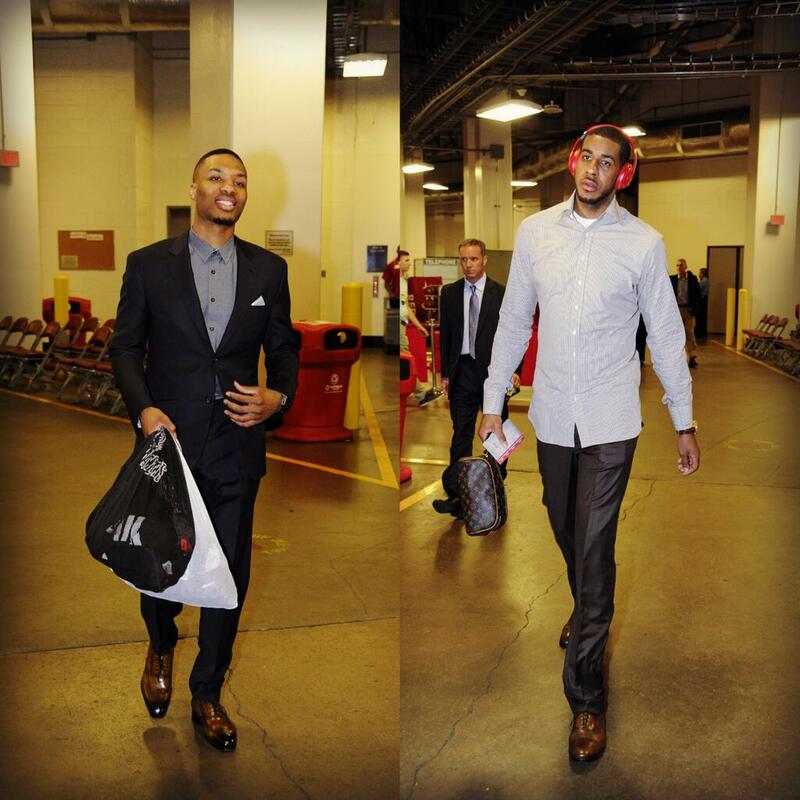 So far, what is your favorite fashion from the 2014 NBA Playoffs? Let us know by commenting below!